The reproductive apex produces a flower or an inflorescence and replaces the vegetative apex. The flowering shoot is considered as homologous to the vegetative shoot. According to Gregoire, the reproductive meristem is structurally different from vegetative meristem. He suggested that reproductive apex consists of a meristematic Mantle and a Core. The two superficial layers of the mantle give rise to the floral parts and also contribute cells to a parenchymatous core. Most investigators criticized Gregoire’s concept and concluded that at the time of flowering the vegetative shoot apex undergoes physiological and histological changes and is directly transformed into a reproductive apex. It has been found that inflorescence and even single flowers exhibit plastochronic size fluctuations during the development of bracts, perianth, stamens and carpels as in vegetative shoots. He considered that reproductive apex originates by progressive metamorphosis of the vegetative apex. According to plantefol, the Anneau Initial forms the sepals and petals while the stamens and carpels are derived from Meristem D’ Attente. But the concept of a “waiting one meristem” which becomes active only when the apex becomes reproductive is not supported by many investigators. They consider that the apex as whole enter a new phase of development. He stated that the basic function of the vegetative apex is to promote longitudinal growth of the axis, while the reproductive apex produces a meristematic envelop rib meristem consisting of large, vacuolated cells is present. The first change to reproductive stage is the increase of mitotic activity on the boundary between the central mother cell zone and the rib meristem zone. Later on, the cells of central mother cell zone also become smaller and rich in protoplasm. In this way, all the cells above the rib meristem are added to the tunica, the cells of which are more or less isodiametric and are relatively small. Following these changes, mitotic activity and growth ceases in the cells of rib meristem and of the pith below it. Thus, in the apex parenchymatous pith surrounded by meristematic cells develops. Depending on species, only the flower parts or the bracts, the axillary branches of the inflorescence and the flowers themselves develop from these meristematic cells. In embryonic stage, only the pro-meristem of the root or sometimes an embryonic radicle may be seen at the base of the hypocotyl within a ripe seed. The root apical meristem produces cells towards the axis and also away from it, initiating the root cap. Due to presence of root cap, the root apical meristem attains sub-terminal position. Root apical meristem also differs from the shoot apical meristem that it forms no lateral appendages such as leaves and branches. The root branches arise endogenously beyond the region of most active growth. The root grows more uniformly in length than shoot due to nodes and internodes. The young root axis more or less clearly separated into a future central cylinder (plerome) and cortex (periblem). In their meristematic state, the tissues of these two regions consist of procambium and ground tissue, respectively. Many roots have a pith-like region in the center. Usually the root protoderm does not arise from a separate layer of the protomeristem. It has common origin with either the cortex or the root cap. This theory was put forth by Nageli. According to this theory, in some of the pteridophyte, e.g., Equisetum and Dryopteris, the entire root develops from a single tetrahedral apical cell. This cell divides in such way to add new cells to the body of the root from its upper three sides and to the root cap from its base. The apical cell theory was superceded by the histogen theory. Although recent researches have proved that histogens do not exist in shoot apices, however, many authors use the term Dermatogen, the meristem of epidermis, Periblem, the meristem of cortex, and Plerome, the meristem of central cylinder, in connection with the root, but in different meaning from those as used by Hanstein. The mother cells of various tissue systems of the root are replaced, at relatively long intervals, by new cells which are derived from the common permanent initials. In many cases, more than one tissue develops from a group of temporary initials, therefore, terms protoderm, Meristem of the Cortex and Meristem of the Vascular Cylinder, may be used for the meristems derived from the Pro-meristem, i.e., from the zone of permanent and temporary initials. He is of the view that the meristems of different tissue systems can be traced in the root apex at various distances from the central cells i.e., the permanent initials. In species, the initials (temporary) of the various, tissue systems are already discrete immediately adjacent to the central cells, known as Closed Type. These initials either represent those of the vascular cylinder and of the root cap. 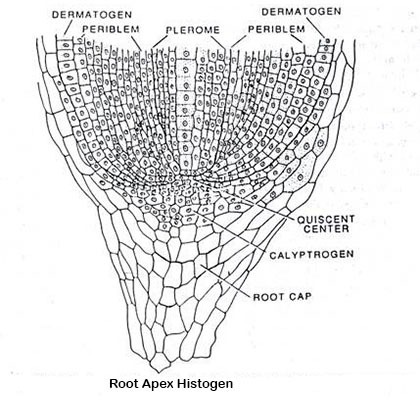 Janczewski named the special initials of the root cap as Calyptrogen. In other species, the meristems of the different tissue systems finally become distinct only some distance away from the central cells, known as Open Type. In this type the common initials for the cortex meristem, root cap, and protoderm or for the meristems of all the tissue systems appear on the periphery of the central cells. Recent research on the root apex has shown that a group of cells at the pole of the stele and cortex have a very low mitotic activity. This group of cells which appear in the shape of a hemisphere of disc, was termed as Quiscent Center. The cells on the periphery of this hemispherical region are meristematic and may be regarded as the constituents of the pro-meristem. The existence of the quiescent center has been demonstrated in the root apices of many species by various physiological and biochemical techniques including irradiation and feeding of roots with labelled compounds involved in the synthesis of DNA. This theory was put forth by Schuepp in 1917. This theory is similar to tunica-corpus theory of the shoot apex and is based on differences in the planes of cell divisions. Since the root changes in diameter during growth, there are various points at which a single longitudinal file of cells become a double file as a result of cell division. At these points a cell first divides transversely and thereafter one of its daughter cells divide longitudinally. This is called T-Divisions, because the cell walls form a T-shaped structure. In some zones of the root, mainly in the center, the bar of the T faces the root apex, in other words it faces away from the apex, i.e., like an inverted T. These ones of root, delimited by the planes of cell divisions, were called Korper (body) and Kappe (cap) respectively.